Word search puzzles are always fun. 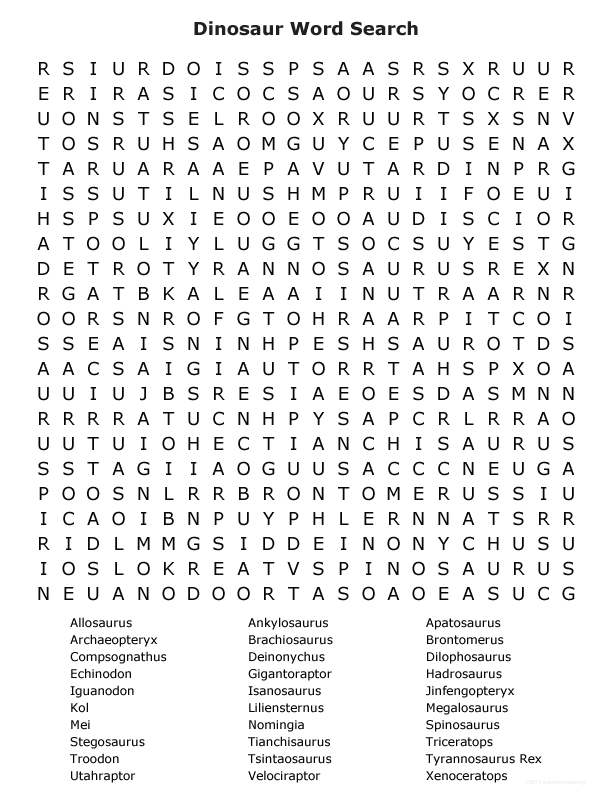 Check out this dinosaur word search puzzle with the names of thirty different dinosaurs. Search for the dinosaur names horizontally, vertically and diagonally through the puzzle. This puzzle is available for download as a PDF file, or you can click the image above for the full-sized puzzle. If you need a little help finding a particular dinosaur, take a peek at a solved version. If you need a lot of help or prefer offline help, a PDF of the solved puzzle is available. Allosaurus – One of the most common Jurassic predators. Ankylosaurus – Heavily armored Cretaceous dinosaur. Apatosaurus – Dinosaur formerly known as Brontosaurus. Archaeopteryx – Ancient, flying reptile about the size of a pigeon. Brachiosaurus – A long-necked, gigantic plant-eater. Compsognathus – Like a vicious chicken. Deinonychus – One of the most fearsome Cretaceous raptors. Dilophosaurus – Dinosaur with a distinctive bony crest on its head. Echinodon – An ornithopod that had a set of canines. Gigantoraptor – Huge oviraptor that weighed in excess of two tons. Hadrosaurus – New Jersey’s official state dinosaur. Iguanodon – The second named dinosaur. Isanosaurus – One of the first sauropods to walk the earth. Jinfengopteryx – Feathered dinosaur once considered a true bird. Liliensternus – One of the largest Triassic carnivores. Megalosaurus – The first dinosaur discovered and named. Nomingia – Small dinosaur with a tail like a peacock. Spinosaurus – Dinosaur with a sail-like fin on its back. Stegosaurus – The small-brained, spike-tailed plant eater. Tianchisaurus – This dinosaur’s species name honors Jurassic Park. Triceratops – The famous three-horned plant-eater. Troodon – Possibly the smartest dinosaur that ever lived. Tyrannosaurus Rex – The king of the dinosaurs. Utahraptor – Probably the largest raptor. Velociraptor – A small, vicious dinosaur. Xenoceratops – Dinosaur with a name meaning “alien horned face”.